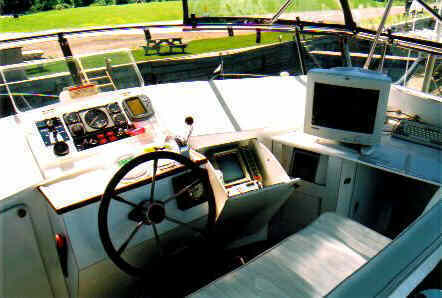 What I used with my W45 was Twin Hamilton Jet connected one each to two 250 HP Diesel engines. 31 knots at the max while 22-25 knots at economical speed. For a steel hull at 15 Knots, Twin Screw at 150 HP may be achieved. But then the propeller design must match with the gear ratio and engine torque. Also, the W45 is designed as planing hull and its best to make it run over 15 Knots and attain the planing speed. Each STUDY PLAN contains ALL the construction drawings for each material - STEEL, ALUMINUM, FIBERGLASS as applicable to the particular boat plan - with up to 25 sheets per plan! Lists of materials - Technical information - Numerous construction drawings are all included. You can view & print the drawings in full or in sections. BUILDING PHOTOS are included in the study plan package. 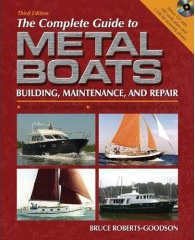 PLUS you receive a FREE (value 79.95) e-book BUILD YOUR OWN BOAT. 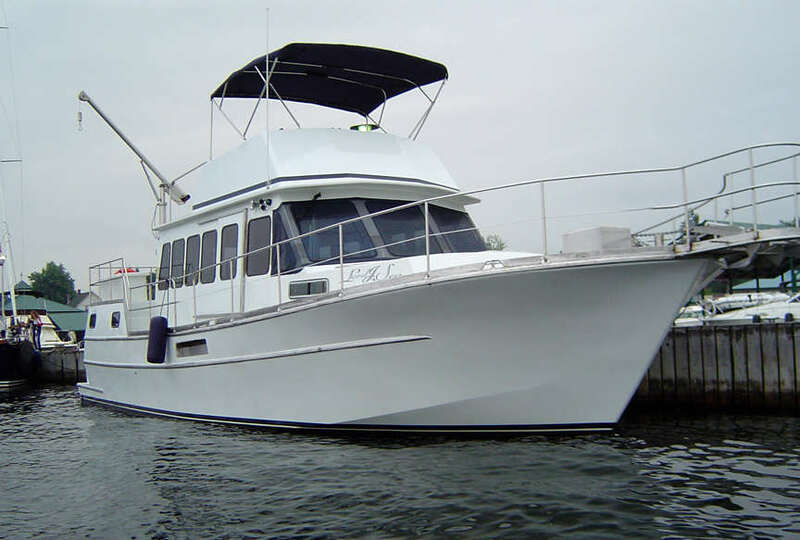 Each plan contains all the construction drawings for FIBERGLASS, STEEL OR ALUMINUM construction, plus bonus drawings covering electrical, plumbing and engineering, everything you need to build your boat. 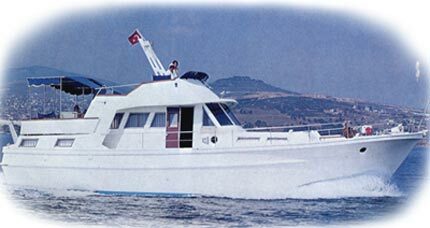 This semi-displacement cruiser can be built as a Charter fishing boat, Family Cruiser or Trawler Yacht simply by varying superstructure and accommodation arrangements. You can build the Waverunner 45 in either fibreglass, steel or wood epoxy. The design has been built successfully around the world as the accompanying photos show. This is a very popular design although the bow section, when building in steel, does take more work to form up than the WR 44 which was drawn with computer aided equipment. If ocean work is anticipated then the flared bows of the WR 45 may be preferred. L.O.A. 13.71 m 45' 0"
L.W.L. 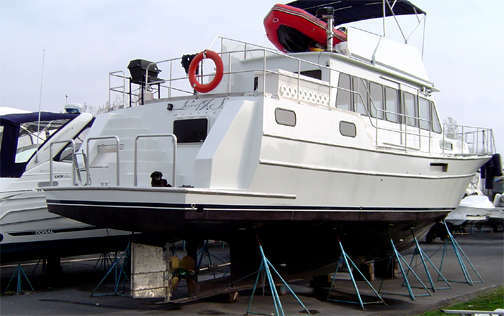 12.19 m 40' 0"
BEAM 4.57 m 15' 0"
Note the added stern fairings and swim platform. You may want to customize your boat in this way but always check with the designer first before making additions or changes to the original design. 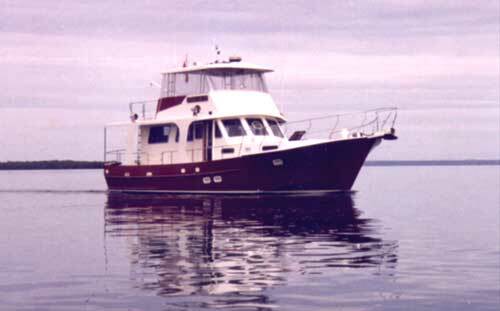 Bruce Roberts Designed 45' Trawler Christine Marie is a very special boat Custom Built to Lloyds specifications using a cold molded epoxy process. 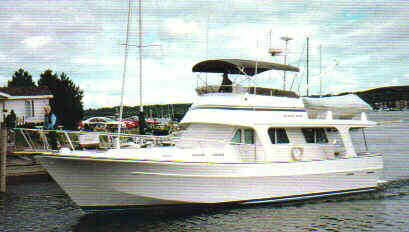 This boat was built and equipped for long range economical cruising in South Florida and the Bahamas. The impressive equipment list includes a 354 Cu. In. 135 HP Perkins diesel engine with a 3-1 transmission. There is also A 3.5 KW Onan Diesel generator and bow thruster. Dear Bruce, We have never met, but a number of years ago I purchased a set of boat plans for the Waverunner 45 through your Maryland site. I have been around boats and the water all my life, with my parents, and then on into my own family. My wife and I planned to retire early, and being an advocate of Robert Beebe on long range cruising, we would like to leave our great lakes, cruise down the east coast to the keys, and island hop down to Venezuela, and then head back home. Taking our time, stopping and enjoying places we found interesting. 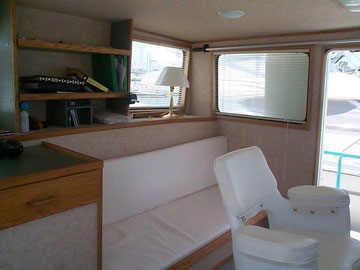 Next step, we started looking for a boat to take us Long Range Cruising at an economical rate. So quite by accident we bumped into (literally) a couple on board a Waverunner 45 in the Port Severn locks on the Trent System, and the upshot of this is that we were invited onboard for a look-see. 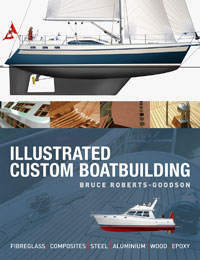 It was obvious that this was the boat we had been looking for, and it was our first introduction to Bruce Roberts Designs. This particular boat had been constructed down on the east coast somewhere in Maine. To this day I cannot remember the vessels name or the owners, both of which I had on their ships card, and lost somehow. 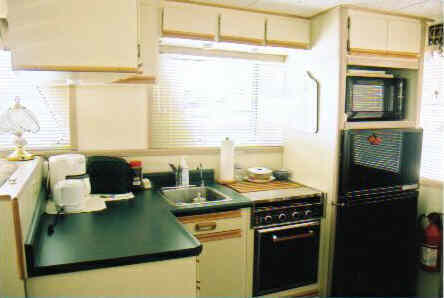 I could kick myself many times over as I would have liked to contact the owners many times over the years for advice. All I can remember is that the vessels name started with a V--------- and sounded I believe something like "Velcro". This boat had been constructed of glass over foam by the yard for the hull and decks, with the owner finishing her off, including mechanicals & interior. 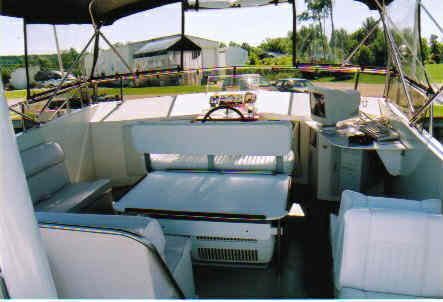 The only departure from your boat plans was to extend the sedan roof over the rear cockpit for sun protection during southern cruising. Well needless to say, I ordered study boat plans from you, then later the full size boat plans, to begin building the sedan version using the West System. After building a suitable strongback I began construction and carried on accordingly. Our boat was built using kiln dried B.C. fir, clear, for all frames, stringers, keel , deck, house, and sedan beams. 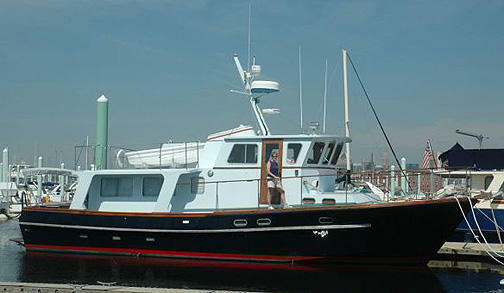 The hull is 3 layers of 1/4"mahoghany as per plan; all decks & sedan top 1/2" mahogany ply. Sedan roof, deck house, and all areas of fwd trunk cabin fully insulated for heat/cold (3" waterproof glass insulated with vapour barrier). The entire hull was given 2 layers of 10oz glass cloth, and all deck areas, fwd trunk, and upper sedan bridge have 1 layer 10oz glass cloth. All inside joints/corners are epoxy filleted, & all outside edges well radiused. I can say with all honesty, From the photos you will see the beautiful lines you designed into her. Wherever we pull in, boaters are always coming over to look her over and ask questions, She is greatly admired as a vessel departed from the norm with very graceful lines. 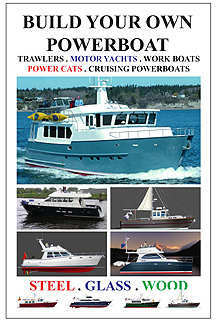 There are 5 photos to view at the above site, and she is built to your boat plans. With the tankage near capacity she will cruise along very comfortably @ 2300 giving us a true speed of 8.2kts as per g.p.s. I estimate that we are burning approx 2.5 to 3.0 gph. At present I have no means for an exact measure such as a floscan meter, but I believe I am fairly close. There is a bowthruster fwd with a 7" tunnel with an electric drive, which to date has been more than sufficient for our needs. We have no ballast aboard, and at present sit a few inches above blueprint W.L. (Chines at the after end are approx 1/2" above water at rest) Cruising Geo Bay and the North Channel this past summer she behaves very well and takes heavy seas with no fuss and little movement. I just wanted to write you and let you know how very well pleased my wife and I are with the boat as a whole and her performance.